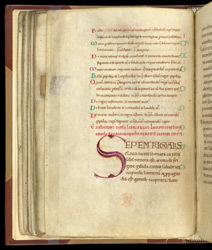 The manuscript also contains Paul the Deacon's 'History of the Lombards'. Written in the late 8th century, it is an important account of one of the early medieval Germanic kingdoms. Like most other early medieval histories, it combines a factual narrative with ancient myths and stories of popular traditions. At the top of the page is the ending of the prologue and list of chapters for the first section ("Book I"). Book I begins at the large S, below the rubric "Paul, monk of Monte Cassino, editor".